If you’ve just enrolled in a training class or you’re putting on your welding cap for the first time, then spending a ton of cash on new welding equipment makes zero sense. You need the best cheap welder to help you learn the skills that your class needs or to learn how to complete basic projects at home through trial and error. Just because a welder is cheap doesn’t mean it can provide inconsistent results. There are good cheap welders and there are bad cheap welders out there. Your job is simple: avoid the bad ones. When you have access to a cheap welder, then you are able to open up a new world of possibilities when it comes to home repairs and improvement. You don’t need to sacrifice on quality just to save a few bucks. These top-rated welders are evidence of that. Knowing what type of welding you plan to do is the best way to maximize the potential of an affordable welder. Here are the key points that you’ll want to consider as you look at each make and model in this category. Welding Discipline. MIG welding is good for steel and aluminum alloys. It can be used on a variety of materials and is suitable for thicker metal plates. Stick welding is even better for thicker metals, especially if you need to weld cast iron. TIG welding is better for thinner metals and exotics. Get the welder you need for the discipline you plan to practice. Power Specifications. There are input and output considerations which must be looked at when shopping for the best cheap welder. You may need alternating current, direct current, or an AC/DC welder. Cheap welders tend to have 100-150 amps for output, which can limit the thickness of the metals you can weld. There is also the duty cycle to consider. Welder Status. Some of the cheap welders that are in this category are actually refurbished welders. They were returned or exchanged because of an issue that presented itself to the first owner. The brand is certifying the quality of the repair on a refurbished product, but it still isn’t going to be a brand new welder. There are some benefits to purchasing a used or refurbished welder. They are generally cheaper, have a traceable track record in terms of performance, and usually come with some sort of warranty or guarantee. Used or refurbished equipment will also typically have a lower lifespan than a brand new product. Rather than risk trying to spot a good deal on the used or refurbished market, the better option is to invest into a new, but still cheap, welder that meets your specific needs. Unfortunately, there just isn’t one welder that can provide a one-size-fits-all solution in our industry today. That is why there are multiple welding disciplines available. Each one offers specific advantages and disadvantages that must be considered. If you plan on using your welder for basic joining applications, then a cheap MIG welder is likely your best option. MIG welding is usually the easiest to learn, can work with thick plates on multiple passes, and welds common metals. It will perform most of the tasks that a stick welder can perform without going through the same number of consumables. If you’re looking for precision welding, then TIG welding is generally your best option. You can precisely weld thin materials with lower distortion, creating high-quality work. This includes the ability to produce x-ray quality welds. Stick welds require little in the way of equipment, so you can usually find a better welder for less money in this category. Most materials can be stick-welded as well and it is easier to use a stick welder outside compared to the other welding disciplines. It also tends to be a more forgiving welding discipline, especially if the metals being welded aren’t in a pristine condition. If you plan to perform some light repair work on aluminum, steel, or stainless steel on materials that are up to 3/16-inch thick, then a 130-amp welder will meet your needs. Look for a welder that offers a 20-30% duty cycle and you’ll be able to perform most of your tasks. Fabrication jobs or heavier repairs will need a stronger welder. You’ll need a unit that can produce at least 200 amps and have a 40% duty cycle at minimum. Those needs will take you out of the cheap welder category for the most part. The bottom line here is this: your welder should be able to have enough amperage to ensure that you can produce a consistent root pass. If that first pass isn’t very good, you’re not going to be able to make up for it in subsequent efforts. Instead of purchasing the cheapest welder possible, it is essential that you purchase that cheapest welder that can guarantee you’ll have the chance to create a good root pass consistently. Many of the welders that you’ll find in this category are priced around the $100 mark. These welders have limited amperage, but also tend to work on standard household outlets. That means you can take them to your project and not need to worry about the voltage of the outlet or the amp rating of the circuit. This price applies to MIG and stick welders. TIG welders that are cheap tend to start around the $400 mark. If you want an A/C TIG welder, a cheap model might be priced around $1,000. A good compromise for those looking for cheap TIG welders is to shop for a multi-process welder. They tend to start in the $250-$400 price range. This is a solid little stick arc DC welder that does an excellent job in portable situations. It features a 10-foot work clamp cable and a 10-foot electrode holder cable, which is supported by a 12-foot power line. It’s only rated for 115 amps, but does offer a 60% duty cycle at that level. It’s USA and ETL listed and features lGBT inverter technology for a smooth welding experience. Fast recovery diodes help to support your work. It also works effectively as a high-powered soldering machine in addition to the welding capabilities. A small, but effective machine. 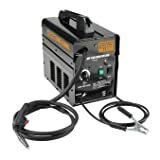 This is a 100-amp arc welder that works on any standard household outlet. It provides 110V AC welding, giving you a cheap little welder that can go just about anywhere. It won’t tackle your big projects, but it’s perfect for those small tasks that need to get done or those little emergencies that come up. Light repairs at home or on the farm, small jobs on vehicles, and similar chores are the specialization of this welder. It’s nothing fancy and it tends to run a little hot, but if you take care of it, this welder will take care of you. If you’re looking for a cheap MIG welder that doesn’t offer a lot of frills, then this is a great option to consider. It offers flux-cored welding only, so you don’t need to worry about the shielding gas here. This welder can handle materials that are 24-gauge on up to ¼-inch for a wide variety of tasks. It will accept 2-pound of 10-pound spools and features a 125-amp output that stays consistent. Welding is supposed to be fun and easy and that’s exactly what will happen with this great cheap welder in your shop or garage. If you’re looking for a light, portable welder that will give you a flux-core experience, then take a look at this nice little welder. It only powers up to 90 amps and has a single-phase input, but it still does a consistent job for mild steel projects. Having the variable speed wire control on this welder is a fantastic addition for those small jobs that tend to build up around the house. It also offers a thermal overload protection so you don’t have the welder overheating like many cheap welders tend to do. This is an excellent value purchase. Purchasing an off-brand welder can be a hit-or-miss experience. This little welder isn’t going to blow you away with power or speed, but it still can get the job done as a MIG flux core welder. It runs as high as 130 amps, but the duty cycle is 10% at 105 amps, so it’s tough to weld at full capacity with this welder. You’re at 35% on 60 amps as well; so try to be a little patient with this machine. The wire stays live as well, even with the trigger not being pulled, so keep that in mind as well if you grab this machine. The best cheap welder will meet your needs without killing off your budget. Stop letting those small chores build-up around the house by getting one of these fantastic little welders today. If you need to find the best cheap welder of them all, we’d say the Chicago Pneumatic has the versatility, portability and affordability you’re looking for.